Pop up tours – Thursday evenings 11th and 25th May at 6.30pm. Hove has been home to women whose ideas have shaken up our world – from some of Britain’s first women doctors to suffragettes, campaigners to boundary shifting entertainers. Walk in their footsteps and hear their amazing stories on this tour. Starts in St Ann’s Well Gardens, BN3 1PL. 1.5 hrs. Pop up Tour – Wednesday evening 7th June at 6.30pm. From Ladies to ladies, scientists to sportswomen, Kemp Town has inspired some incredible women. Hear how worlds as diverse as policing, fashion, education, shopping and the arts were shaken by local women on this gentle walk. Starts at St George’s Church, BN2 1ED. 1.5 hrs. Saturday afternoons 27th May, 3rd June at 2pm. For official Fringe Tours book at brightonfringe.org, call 01273 917272 or just turn up on the day. Pop up tours are weather and interest dependent. Please let me know if you would like to come by emailing me at historywomenbrighton@outlook.com or calling 07758 296563. Get in touch with Brighton and Hove’s feminine side on a walking tour with Royal Pavilion and Museums guide, Louise Peskett. Discover an alternative view of the city illustrated by the stories of the incredible, outrageous, and brilliant women of its past. History Women Brighton – Women soldiers, music-hall stars and rebellious princesses come alive on this stroll from central Brighton’s oldest church through the Lanes, Pavilion Gardens and Brighton’s Cultural Quarter, finishing at the Theatre Royal. History Women Hove – Starting in central Hove’s St Ann’s Well Gardens and proceeding through the area’s grandest squares to the seafront, this walk follows the footsteps of some of Britain’s first women doctors, suffragettes, social campaigners and artists, and takes in a pioneering women’s hospital and game-changing girls’ school. 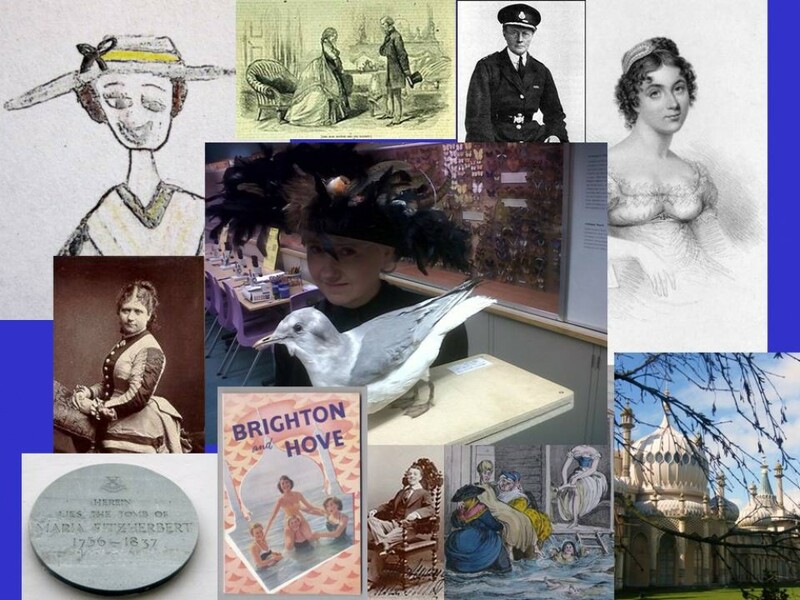 History Women Kemptown – Hear how worlds as diverse as policing, fashion, education, and corsets were influenced by women who once lived in this atmospheric and historic suburb of Brighton! Starts at St George’s Church. Victorian Working Class Brighton – During the nineteenth century the Queen’s Park/Hanover area developed as a vibrant and lively working-class district. Join me to discover traces of these long-gone communities in old shops, pubs, slipper-baths, the work-house, and school. Starts at St Luke’s Church. The Royal Pavilion Estate – A visit inside the Royal Pavilion is a Brighton ‘must-do’ but what about the outside? This hour’s walk around the Royal Pavilion Gardens and surrounds explores the creation of this beautiful green space, the history of the Gardens, its adjoining gates and buildings, and its First World War legacy. Don’t want to walk? I offer the above walks – and more – as seated, illustrated lectures. Let me visit your group and enjoy the stories from the comfort of a chair. Full list on my website www.historywomenbrighton.com. All walks will go ahead at pre-set times during the Brighton Fringe in May 2017 as usual and, hopefully, if the weather forecast looks good, in Spring. Check here or drop me an email if you’d like to be on my mailing list. See you soon!